Biodiversity Sri Lanka (BSL) recently hosted a private sector consultation for a delegation from the China Council for International Co-operation on Environment and Development (CCICED) visiting Sri Lanka to gain insights on local needs, for a Special Policy Study (SPS) on greening the Belt and Road Initiative (BRI). The meeting was held at the Ceylon Chamber of Commerce and was attended by BSL members, representatives from international and local banking institutions, construction and infrastructure development companies, the UNGC and IUCN. ‘Green Initiatives of the Hambantota International Port Development’, presented by Mr. Will Wang – Function Manager, Hambantota International Port Group and ‘Environmental Challenges Faced by the Construction Industry of Sri Lanka’, presented by Prof. Ranjith Dissanayake – Vice-Chairman of the Chamber of Construction Industry Sri Lanka, were followed by discussions on the potential for greening BRI interventions in Sri Lanka and aligning them with achieving the UN Sustainable Development Goals (SDG). Significant recommendations which emerged from the discussion were that the intentions and processes involving BRI interventions in Sri Lanka are to be made as transparent as possible, that they should include active participation of all concerned stakeholders and that they should endeavor to demonstrate adherence to international best practices in the application of environmental and social safeguards. 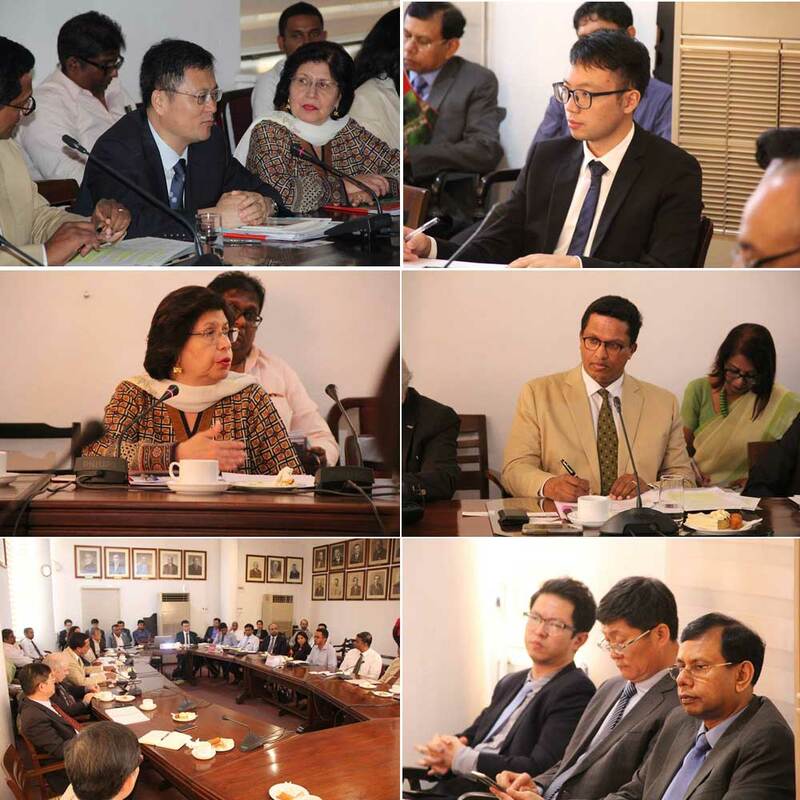 Being a private sector-led, member-driven organization, BSL will continue to play a leadership role in coordinating the pursuit of these recommendations through its Standing Committee network, collaborating on areas that can be initiated in the implementation of the various BRI projects, and encouraging sustainable and green initiatives which would safeguard the environmental and social concerns of the country in the long term. The Special Policy Study led by the CCICED, aims to identify the interaction between a green BRI and the implementation of key environmental goals of the UN SDGs, in order to lay the research ground for decision-making and contribute towards the promotion of green development on the BRI. It will propose concrete policy suggestions for the construction of the green BRI and in this process, will carry out a series of case studies in China and partner countries along the Belt and Road, based on which it will identify the local need for green development under the BRI. The results of these studies will feed into the UN SDGs and the BRI summit in 2019. Biodiversity Sri Lanka (BSL): BSL is a national platform entirely owned and driven by the private sector, established to promote strong engagement of the corporate sector in biodiversity and environmental conservation in Sri Lanka. BSL actively promotes strong leadership of the private sector in the areas of biodiversity and environmental conservation, through the provision of technical support, sharing of information, knowledge and experience, the promotion of best practices through active learning and understanding mechanisms and by initiating and facilitating dialogue between State and civil society partners and the private sector, advocating biodiversity-friendly policies and positive instruments that campaign for the conservation of Sri Lanka’s fragile environment. BSL’s overall mandate is to help raise awareness on biodiversity and sustainability issues amongst the Sri Lankan business community. China Council for International Cooperation on Environment and Development (CCICED): The CCICED is a unique organization that has championed the environment and sustainable development for over 26 years, and garnered long-lasting support and respect from the international community. With the endorsement by the Government of China as a high-level policy advisory body and a leader of China’s State Council as the Chairperson, the CCICED solicits the advice of eminent Chinese and international high officials, experts and scholars. It has opened the door to international experience on sustainable development and built a bridge between China and the international community on environment and development. CCICED is truly a platform of exchange, enabling the international community to understand China and support China’s engagement with the world. The Ministry of Ecology and Environment of China is the hosting department of CCICED. CCICED aims to conduct policy research on critical environment and development challenges for China and the global community, and to recommend forward-looking, strategic and pragmatic policies to the Government of China. CCICED policy recommendations have been highly valued by the Chinese Government and incorporated into China’s reform process.